The European company based in Helsinki, Finland, with a North American office in New York and another in Asia Pacific, turns live events and sponsorship into digital, gamification and interactive experiences using the Uplause System and technologies. “Over 6 million players, 600 events and 40 stadiums in 22 countries are part of their user base and it is growing rapidly worldwide,” says Aura. The recent Guinness world record set at 142.2 dbA by the KC Chiefs fans at Arrowhead Stadium during a recent 2014 Monday Night Football game on national TV against the NE Patriots, was a direct response to the Seattle Seahawks 12s and 12thMan fans that set the previous world record at Century Link stadium. In fact, this is the second time this back-and-forth world record breaking feat between the Hawks and Chiefs’ fans has occurred. Perhaps you will see it see once again tonight on ESPN during the MNF game at AT&T Stadium between the Dallas Cowboys and the team from Washington DC. I no longer use, promote or believe that saying the R-word is ok, thus they are the team that hails from Washington until this is changed for the better of mankind. 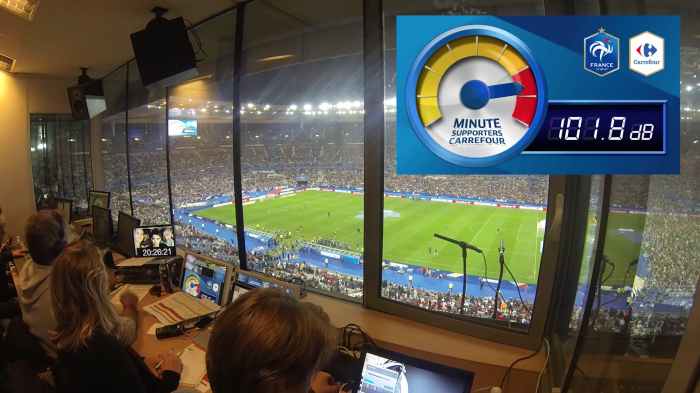 If you own a sports team, manage a venue or IP address, or represent a brand that is looking to identify with a sport tech product that is already in use at, Staples Center, MSG, and AT&T Stadium, Stade de France (Paris), Bell Centre and Prudential Center, and the Sap Center, Uplause is your ticket to enjoying a platform for live events that pumps up fans and teams by displaying a meter that calculates the noise level in dB levels on big screens throughout a venue. Using an integrated arena dB system is fast becoming a standard for major venues and teams. The latest NHL users are the New Jersey Devils at the Prudential Center. But creating one is not a walk in park, e.g. it took the NHL’s Washington Capitals two years to create one in-house version. With Uplause, teams can get started in days. Uplause is the leading selection for brands/agencies, teams, leagues, venues and rights holders that want to upgrade their live event operations. For inquiries how to get Uplause to your event, please email contact@uplause.com or visit the website www.uplause.com. The European company based in Helsinki, Finland, with a North American office in New York and another in Asia Pacific, turns live events and sponsorship into digital, gamified and interactive experiences using the Uplause System and technologies. Sports Techie, Their motto: “Everyone plays, everyone enjoys. The joystick is you,” certainly fits what the proprietary system does for clients, stadiums and fans. When I was a kid in Seattle, the Kingdome and now Safeco Field, ran a popular hydroplane race at Mariners games that moved the boats faster around the course according to fans boat color of preference and loudness. This promotion started off looking rather 2-d on the dome screen and ending up almost 4-d in quality on the awesome Marinervision Panasonic HD screen. I am fairly sure the fan meter in place both back in the day and today, measured the octave level of fans to some degree or another, but the former venue’s software and hardware were definitely not accurate enough for use as Guinness world record verification tools, while the latters may not be either. I asked Uplause if their system is precise enough to verify world record dbA attempts and am awaiting confirmation. 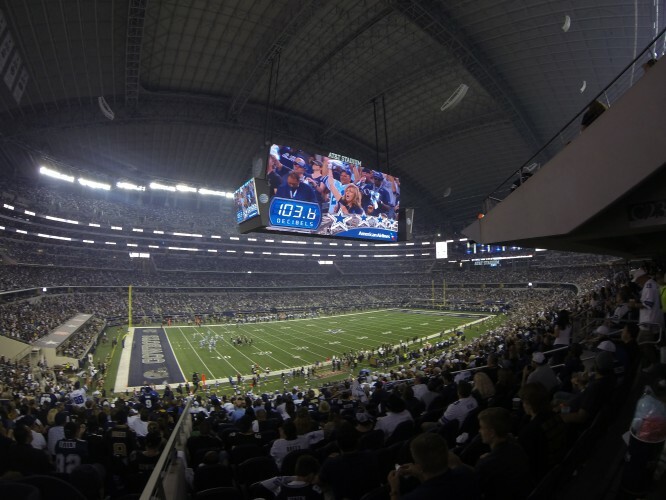 If you happen to be at the MNF game this evening in Arlington, Texas at one of the world’s most impressive venues cheering on the first place Cowboys or the last place team, be sure to have your vocal cords ready to help break the 100 dB level and beyond. The ATT stadium roof will need to be closed for any chance at 142.3 but if it happens, viewers on TV, on mobile devices and in person will be able to see the decibel meter displayed on their incredibly large big screen, so cheer on.